Burlington is a city and the county seat of Des Moines County, Iowa, United States. The population was 25,663 in the 2010 census, a decline from the 26,839 population in the 2000 census. Burlington is the center of a micropolitan area including West Burlington, Iowa, and Middletown, Iowa, and Gulfport, Illinois. Burlington is the home of Snake Alley, once labelled the crookedest alley in the world. Prior to European settlement, the area was neutral territory for the Sac and Fox Indians, who called it Shoquoquon (Shok-ko-kon), meaning Flint Hills. In 1803, President Thomas Jefferson organized two parties of explorers to map the Louisiana Purchase. 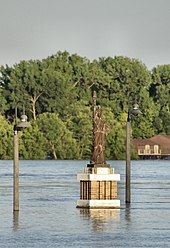 The Lewis and Clark Expedition followed the Missouri River, while Lt. Zebulon Pike followed the Mississippi River. In 1805, Pike landed at the bluffs below Burlington and raised the United States Flag for the first time on what would become Iowa soil and recommended construction of a fort. The recommendation went unheeded. In 1837, Burlington was designated the second territorial capital of the Wisconsin Territory. The Iowa Territory was organized in the following year, and Burlington was named as its first territorial capital. The government used "Old Zion," the first Methodist Church in Iowa (located near what is now Third and Washington streets), to conduct its business. A historical marker commemorates the site of the church and early territorial government. This town [was] originally called Flint Hill- the Indian name was Shoquokon, Flint or Rock Hill. [It is] beautifully elevated, situated on the west side of the Mississippi River, a place of very considerable business. The town is very well built. Houses are good, generally taste[ful], brick dwellings. A great many handsome residences on the more elevated parts of the bluff. The number of inhabitants between 3,000 and 3,500. ... Was the first seat of government after the formation of the Territory of Iowa. The view of the city is extremely picturesque from the river. The main part of the city is situated like an amphitheater formed by the surrounding hills, beautiful buildings and private residences on the eminences around. From the location of Burlington it must always be a place of considerable trade. The city is well built [in the] modern style, a very intelligent population... The river here is over 3/4 of mile wide and steam ferry boats constantly plying between this and the Illinois shore. Iowa's nickname, "The Hawkeye State," has its roots in Burlington. At Judge David Rorer's suggestion, publisher James G. Edwards changed The Iowa Patriot newspaper's name to The Hawk-Eye and Iowa Patriot in tribute to his friend, Chief Black Hawk. Rorer is said to have found the name in James Fenimore Cooper's The Last of the Mohicans, but Edwards proposed the nickname to "...rescue from oblivian [sic] a momento [sic], at least of the name of the old chief." Burlington was a bustling river port in the steamboat era and a central city to the Chicago, Burlington and Quincy Railroad. The "Burlington Route" (1848–1970) merged into the Burlington Northern Railroad (1970–1996), which in turn merged into the BNSF Railway (1997–present). The "Burlington" name has been given to one of the United States' largest railroads. One of BNSF's main east-west lines still crosses the Mississippi at Burlington. In the late twentieth century, retail expanded with suburbanization of the population. After purchasing Benner Tea, Aldi opened its first store in the United States at Burlington in 1976. Westland Mall opened in nearby West Burlington in 1977. According to the United States Census Bureau, the city has a total area of 15.24 square miles (39.47 km2), of which, 14.48 square miles (37.50 km2) is land and 0.76 square miles (1.97 km2) is water. As of the 2010 census, there were 25,663 people, 10,938 households, and 6,693 families residing in the city. The population density was 1,772.3 inhabitants per square mile (684.3/km2). There were 11,899 housing units at an average density of 821.8 per square mile (317.3/km2). The racial makeup of the city was 81.2% White, 14.2% African American, 0.3% Native American, 0.8% Asian, 0.1% Pacific Islander, 0.7% from other races, and 2.9% from two or more races. Hispanic or Latino of any race were 3.1% of the population. There were 10,938 households of which 29.8% had children under the age of 18 living with them, 41.9% were married couples living together, 14.2% had a female householder with no husband present, 5.1% had a male householder with no wife present, and 38.8% were non-families. 32.5% of all households were made up of individuals and 14.1% had someone living alone who was 65 years of age or older. The average household size was 2.30 and the average family size was 2.89. The median age in the city was 39.7 years. 23.7% of residents were under the age of 18; 7.7% were between the ages of 18 and 24; 24.6% were from 25 to 44; 26.5% were from 45 to 64; and 17.4% were 65 years of age or older. The gender makeup of the city was 48.1% male and 51.9% female. As of the 2000 census, there were 26,839 people, 11,102 households, and 7,105 families residing in the city. The population density was 1,910.1 per square mile (737.6/km²). There were 11,985 housing units at an average density of 853.0 per square mile (329.4/km²). The racial makeup of the city was 86.6% White, 10.0% African American, 0.33% Native American, 0.66% Asian, 0.04% Pacific Islander, 0.90% from other races, and 1.43% from two or more races. Hispanic or Latino of any race were 2.06% of the population. There were 11,102 households out of which 29.2% had children under the age of 18 living with them, 48.2% were married couples living together, 12.0% had a female householder with no husband present, and 36.0% were non-families. 31.0% of all households were made up of individuals and 14.0% had someone living alone who was 65 years of age or older. The average household size was 2.36 and the average family size was 4.94. Age spread: 24.5% under the age of 18, 8.9% from 18 to 24, 26.7% from 25 to 44, 22.7% from 45 to 64, and 17.2% who were 65 years of age or older. The median age was 38 years. For every 100 females, there were 90.9 males. For every 100 females age 18 and over, there were 87.2 males. The median income for a household in the city was $33,770, and the median income for a family was $40,912. Males had a median income of $33,238 versus $23,003 for females. The per capita income for the city was $19,450. About 10.0% of families and 12.6% of the population was below the poverty line, including 20.9% of those under age 18 and 8.9% of those age 65 or over. Burlington's roots are in transportation and manufacturing. Manufacturing plants are among the largest employers in the area, including companies such as American Ordnance LLC, Case Corporation, ABB (formerly General Electric), Champion Spark Plugs, Shearer's Foods and Winegard Company. The largest employer in the area is the Great River Medical Center. Among one of the oldest businesses in Burlington, the Murray factory (now Murray Turbomachinery and owned by Dresser-Rand) which has been in operation in Burlington since before 1900, the original building on Central St. and Washington St. which was divided by the local train tracks, was recently razed. Another long-lived business is Case Corporation, which has been at its current location on Des Moines Avenue, approximately a quarter-mile from the Mississippi River, since 1937. The first backhoes rolled off the assembly line at the Burlington plant in 1957, which is now the only plant in the United States that produces the Case Loader/Backhoe, giving Burlington the nickname "Backhoe Capital of the World." Case is now a division of the Italian holding group CNH Industrial. Employment at Case peaked in the 1980s, according to the Des Moines Register, then declined after "Case initiated a wave of buyouts and early retirements in the 1990s and early 2000s, and ended the contract with the union in 2004"; but in May 2010, the Register reports, Case announced that "it will open a new line that builds corn-picker heads for combines, as early as [Spring, 2012]" and that by mid-2013 it will add more than 200 positions. Over the last several years, several businesses have either left the area or relocated elsewhere. These businesses include Exide, makers of vehicle batteries, CAT, Case Corporation's closest competitor in American made construction equipment, and Lehigh-Leopold, makers of office furniture. This has left some former manufacturing plants around the city empty, but other businesses have moved into them; PPG, maker of auto safety glass has moved into the former CAT plant, and a warehouse has moved into the former Leopold building. In March 2012, the Des Moines Register reported that "Unemployment here is 7.6 percent, compared with the 5.4 percent state average". The downtown area holds a number of buildings listed on the National Register of Historic Places, among them the Burlington Apartments (listed as the Hotel Burlington), the Burlington Railroad Depot, the Des Moines County Courthouse, the Burlington Fire Department central station, the Port of Burlington building, Memorial Auditorium, River Park Place (as Burlington Mercy Hospital), the Burlington Police Department building (as Burlington Paper Company), The Capitol Theater, First Congregational Church, St. Paul's Catholic Church and several others. The downtown skyline is noted for its several church spires. The Burlington Bees play the Swing of the Quad Cities in this July 2004 game at Burlington Community Field. Burlington is the home of the Burlington Bees baseball team, a member of the Class A Midwest League. The Bees play at Community Field, which underwent extensive renovation in 2005. Burlington hosts the Snake Alley Criterium, one of the most physically challenging races in the Midwest. The annual event is held on a 15-block course, with differences in elevation from 555 feet to 678 feet. The course is entirely on city streets, mostly in the downtown commercial area. A one block-long climb is on the historic brick street named Snake Alley. 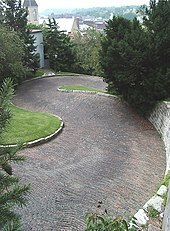 The 276-foot-long Snake Alley has five switchbacks in a 60-foot climb. The average grade is 12.5 percent in that one block. Twice, Burlington has been the finishing point for RAGBRAI, the annual bicycle ride that starts at the Missouri River in western Iowa and ends in eastern Iowa at the Mississippi River. Burlington is served by the Burlington Community School District, which has five elementary schools, two middle schools, one high school and one alternative high school. Private education is also available for kindergarten through 12th grade at Notre Dame Catholic School, and Great River Christian School (GRCS). In 1833 the first school facility for Burlington opened in a log cabin. School District No. 2 of the Township of Burlington was established on March 29, 1849. The Burlington School District has five elementary schools: North Hill, Sunnyside, Grimes, Corse and Black Hawk. All are new buildings or have been recently completely rehabilitated, the newest, North Hill Elementary, received its first students in 2009, there are no elementary school buildings within the school district that are over 40 years old.[when?] The district has two middle schools: Edward Stone and Aldo Leopold. Beginning with the 2010–11 school year, students who had attended Oak Street Middle School (an aging building that was completed around 1907) began attending Aldo Leopold (named in honor of ecologist, and environmentalist, Aldo Leopold, a former resident of Burlington, and author of "A Sand County Almanac"), the new school building is located near the corner of Sunnyside Avenue, and Roosevelt Avenue. Edward Stone, which opened at the start of the 2012–13 school year, is located near the corner of Lawrence Drive and Mason Road. The middle school was named in honor of former JPL head, and Burlington educated Dr. Edward Stone. This building replaced the James Madison Middle School building, which has only been in the system since the mid-1960s. These two new middle schools were built to accommodate more students after a third building, Horace Mann, was gutted by fire in 2005. Burlington Community High School was constructed in 1968, and occupied the following year, with the first graduating class in June 1970. Prior to that, the high school students were educated at a building located near the downtown business district; the building is still standing and for a time served as Burlington Alternative High School, but has been unoccupied since 1996. Notre Dame High School and Elementary schools occupy a building near the Burlington high school. Great River Christian Schools occupies the old Prospect Hill Elementary School building ,426 Harrison St. A third middle school building once existed on the edge of Perkins Park, named Horace Mann, that building was gutted by fire in 2005, and later razed. The school district offices are located near the corner of West Avenue, and White Street, in a large mansion once owned by Railroad tycoon Charles Elliott Perkins, and is nicknamed "The White House," due to the whitewashed facade. The original High School building (which now serves as the School District Maintenance shops) is noted as being the first high school built west of the Mississippi River. Burlington is also served by Southeastern Community College. Burlington Public Library serves the community. The Hawk Eye is a morning newspaper published seven days a week. The paper was established in 1837 and is Iowa's oldest newspaper. Des Moines County News is a once a week newspaper. Burlington's radio stations include WQKQ 92.1 FM, KAYP 89.9 FM, KKMI 93.5 FM, KCDM 98.3 FM, KDMG 103.1 FM, KBKB 101.7 FM, KHDK 97.3 FM, KGRS 107.3 FM, KCPS 1150 AM, KBKB 1360 AM, and KBUR 1490 AM. Burlington residents also listen to stations in nearby communities, most notably, the Quad Cities. Burlington previously had a local TV station, KJMH. It signed on August 2, 1984 from a tower on Winegard Drive. It also had studios in Burlington. Initially an independent station, it became a charter FOX affiliate in 1986, but suffered from duplication from KLJB in the Quad Cities. In 1996, the station became a full-time satellite of KLJB, marking the end of local broadcast TV in Burlington. Today, those in the Burlington-Oquawka Area receive local over-the-air programming from stations in the Quad Cities (where the city is located since then), Quincy, and Ottumwa, including the stations listed below. The town is served by U.S. Route 34, which is the freeway that goes through the middle of town and U.S. Route 61. Iowa Highways 99 and 406 served the town before they were decommissioned in 2003. The two still exist as County roads. Burlington Urban Service (B.U.S.) is a transportation system owned and operated by the City of Burlington. Routes service nearly all areas of Burlington, and nearly 90% of all residents live within 3 city blocks of a bus route. Greyhound Lines and Burlington Trailways provide daily out-of-town bus service. Amtrak, the national passenger rail system, provides service to Burlington, operating its California Zephyr daily in both directions between Chicago, Illinois, and Emeryville, California, across the bay from San Francisco. The Southeast Iowa Regional Airport (IATA code BRL), is located about five miles south of downtown. Commercial service is provided through Air Choice One. This service offers two weekday daily flights to St. Louis and Chicago, while offering single flights on weekends. Quad City International Airport, the area's large international airport, is approximately 70 miles north of the city, in Moline, Illinois. Bart Howard, composer and writer of the jazz standard "Fly Me to the Moon"
Arabella Mansfield, first female lawyer in the United States. ^ John Gray was of European descent. Eliza Jane Gray was of mixed African American and Native American heritage. USS Burlington (PF-51) World War II frigate named after Burlington. ^ a b "US Gazetteer files 2010". United States Census Bureau. Archived from the original on January 24, 2012. Retrieved May 11, 2012. ^ a b "American FactFinder". United States Census Bureau. Retrieved May 11, 2012. ^ a b "Population and Housing Unit Estimates". Retrieved June 9, 2017. ^ "Find a County". National Association of Counties. Archived from the original on May 31, 2011. Retrieved June 7, 2011. ^ "Population & Housing Occupancy Status 2010". United States Census Bureau American FactFinder. Archived from the original on July 21, 2011. Retrieved August 3, 2011. ^ "Data from the 2010 Census". State Data Center of Iowa. Archived from the original on July 18, 2011. Retrieved August 3, 2011. ^ "About The Hawk Eye", The Hawk Eye Newspaper, archived from the original on October 1, 2011, retrieved September 19, 2011 . ^ Antrobus, Augustine M. (1915). History of Des Moines County, Iowa. 1. The S. J. Clarke publishing company. p. 95. ^ Negus, Charles. "The Early History of Iowa". Annals of Iowa. Iowa Division of Historical Museum and Archives, State Historical Society of Iowa. 7 (2–4): 145. ^ Meany, Edmond S. (1911). "Morton Matthew McCarver Frontier City Builder". Annual Report of the American Historical Association for the Year 1909. American Historical Association: 174. ^ Huff, S. W. (Ed. ), Annals of Iowa, Vol. VII (Iowa City: State Historical Society of Iowa, 1869), p. 145. ^ "NAMED THIS CITY", Burlington Gazette, September 22, 1896 . ^ Hoffmann, Gregg (May 10, 2004). "Travel & Visitors Guide: Beyond Milwaukee: Belmont was Wisconsins first capital". Onmilwaukee.com. Retrieved September 19, 2011. ^ "How Iowa Became A Territory". Iagenweb.org. Retrieved September 19, 2011. ^ Williams, William (1920). "Major William Williams' Journal of a Trip to Iowa in 1849". Annals of Iowa. 12 (4): 246–247, edited for minor spelling and punctuation. ^ "The State of Iowa – An Introduction to the Hawkeye State from". Netstate.Com. Retrieved September 19, 2011. ^ Johnson, Patt (September 10, 2015). "Aldi to open Windsor Heights store". The Register and Tribune. Des Moines. Retrieved September 7, 2017. ^ Weymouth, Lauren. "Secrets of the German supermarkets conquering America (24 slides)". MSN: Money. Archived from the original on September 7, 2017. Retrieved September 7, 2017. ^ "Weatherbase: Historical Weather for Burlington, Iowa, United States of America". August 2011. Retrieved June 9, 2007. ^ "Census of Population and Housing". Census.gov. Archived from the original on May 12, 2015. Retrieved June 4, 2015. ^ "American FactFinder". United States Census Bureau. Archived from the original on September 11, 2013. Retrieved January 31, 2008. ^ "History." Burlington Community School District. August 19, 1999. Retrieved on September 16, 2018. ^ "HASTINGS, Serranus Clinton, (1813–1893)". Biographical Directory of the United States Congress. Retrieved March 12, 2014. ^ "Nebraska Governor Kay A. Orr". National Governors Association. Retrieved October 6, 2012. ^ Gue, Benjamin F. (1903). HISTORY OF IOWA From the Earliest Times to the Beginning of the Twentieth Century. The Century History Company. pp. 212 Vol IV. Retrieved June 1, 2011. 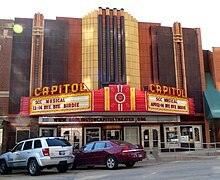 Wikimedia Commons has media related to Burlington, Iowa. Wikisource has the text of the 1911 Encyclopædia Britannica article Burlington (Iowa).